An editorial by Mel Rothenburger. BY ALL ACCOUNTS, things are getting worse instead of better in the fight to clean up dirty needles in Kamloops. While back allies are a favourite place for dropping used needles, they also show up at public parks and private property. And with summer here and water levels steadily getting lower, beaches will once again be littered with them. A lot of good work is being done in the community to collect and dispose of this dangerous drug-addiction flotsam, but it’s not enough. The Social Planning Council is proposing that the plungers in syringes be produced in bright colours such as red or fluorescent orange to make them more visible. That idea has limitations since the needles and syringes often become separated, but it’s another example of the kind of creative thinking needed to deal with the problem. Another, more radical thought has come up, and that has to do with collection. 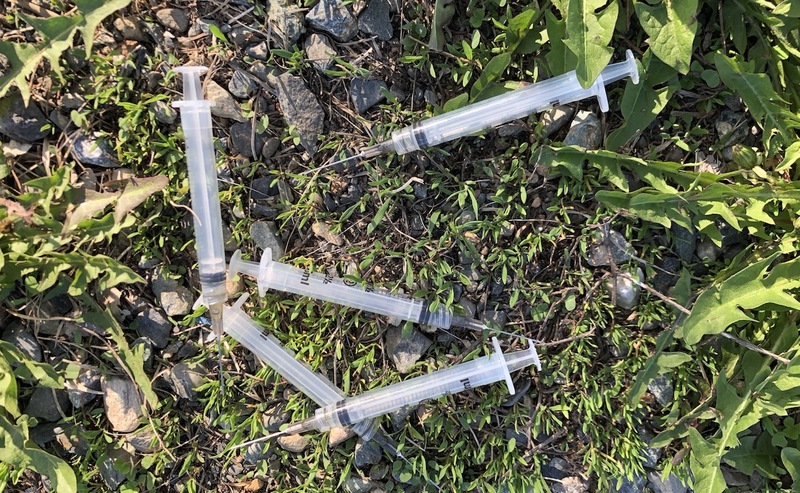 Until now, it’s been a Commandment of needle and syringe collection that when we come upon one we should not try to pick it up, but instead find one of the many agencies involved in clean-up to come and remove it. The problem, however, is so ubiquitous, and growing so quickly, that those assigned the official task of collecting sharps simply can’t keep up with it. Kamloops isn’t alone; other Interior cities have the same challenge — Kelowna, Prince George and Vernon, for example. If we want our communities to be clean and safe from improperly disposed-of needles, we might have to change our way of thinking. Could an awareness campaign teach and encourage the public at large to collect and dispose of them? Could we as citizens and parents learn to carefully check parks, playgrounds, beaches and other public areas before using them or allowing our kids in to play? Could we shift reliance on organized groups to ourselves as individuals? Would we start carrying with us the necessary gloves and tongs and containers? Mel Rothenburger’s Armchair Mayor editorials appear Mondays through Thursdays on CFJC- TV. His Armchair Mayor column is published Saturdays on ArmchairMayor.ca and CFJC Today. Contact him at mrothenburger@armchairmayor.ca. How about if the addict doesn’t bring in his old needle he doesn’t get a new one. This problem is only going to get worse, as the world is being split by the elite, who will continue to pilfer everything valuable on earth for themselves, while the remainder of the population will either work as the elite’s slaves or be left out out of the equation altogether in despair, taking drugs to numb their pain and hopelessness. The west could take a lesson from Portugal, a country that decriminalized all drugs and uses the money previously spent on punishment for treatment instead. Sorry Mel, however there is no way the rest of the public should have to start carrying around safety equipment to carefully collect and dispose of someone elses potentially dangerous material. Those needles appear, from everything I read, see, and hear, be handed out by the handful, with little to no regard for seeing them returned. It appears, at least to a casual observer, we care more for the well-being of those suffering addictions, than we do innocent children who may become infected from the careful disregard for where they may land after use. There has to be a better way, and collection of them by the general public, is not the answer in my opinion. How about these enabling organisations demand a needle back before they get another one. Then the organisations can go around and pick up the mess they are responsible for. 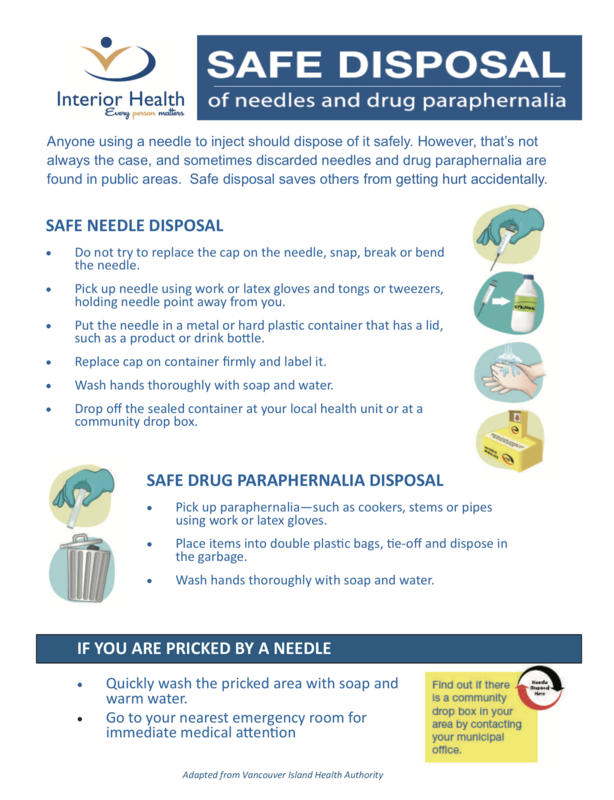 Dirty needles are certainly one visible sign of the drug trade. Your observations, Mel, seem to point to the notion that this issue is here to stay. Another visible sign of the drug trade could be dead vegetation perhaps coupled with the smell of solvent, cat urine or a “chemical” odour. The general public would be naive to even think that all methamphetamine is imported from outside our community. Do some research, as I did, and it will make you lose sleep at night. First of all, the bright colored syringes can only be implemented on a grand scale by changes in manufacturing practices…let’s get a dose of reality here. Secondly, the practice of giving away needles at infinitum by the health authorities needs to be revisited. Perhaps a “needle for a buck” or some sort of similar recycling program needs to be implemented. As it stands I am already quite busy plucking garbage and dog poo filled bags from Kenna Cartwright park…touring the back alleys of Kamloops to collect discarded needles is where I draw the line. But seriously, picking up needles would be a health hazard. Install “needle safe disposall” bins everywhere users hang. Yes, this is the new reality, and yes, users are humans and will abide. God help them if they try to reuse a needle. Note how that has not been considered or overtly noted. Please educate your kiddos on all of this.